Last night’s foreign policy debate was, for me at least, the highlight of the election season. While domestic issues and the candidates’ positions on them are of course interesting and important, let’s face it: foreign policy is my jam. I was utterly disappointed when the “foreign policy” section of the previous, supposedly split-topic debate that consisted of a single question on the attack on the US consulate in Libya. Finally, I could look forward to a debate not only concerning the field I am most passionate about, but also focusing mainly on the region I know the best. Yet what the debate ended up revealing about both Pres. Obama and Gov. 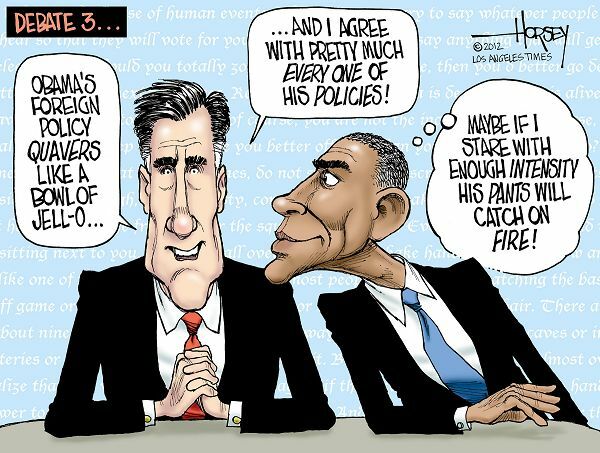 Romney was not their differences on foreign policy, but their almost mind-numbing similarities. While this may not make for the most entertaining debate (the “horses and bayonets” comment aside), it certainly gives me hope that the neo-conservative era of the Bush years is truly over regardless of which party sits in the White House. A clear choice? Courtesy of the Huffington Post. The first question fielded by the moderator was, naturally, about Benghazi. Although I certainly think that the attacks on Benghazi are central to the State Department’s security policy going forward, I do not necessarily agree with the amount of attention that has been paid to them during this election. Given that Libya as a whole remains a complex and urgent issue, to focus on the microcosm of the attacks will forward the agendas of those who wish to downgrade our relationship with the new Libyan government. I am all about having friends in a volatile region, and considering there was little the fledgling government could have done to better protect the consulate when our own State Dept. failed to do so, I don’t think we should be discounting Libya as a possible ally just yet. Gov. Romney raised the usual alarmist bells about “terrorists of some kind” (Al Qaeda?) operating in “ten or twelve countries” including Northern Mali without pointing to how he would deal with such groups while avoiding military involvement abroad. Meanwhile, Pres. Obama insisted that it is “important to step back and think,” a hallmark of his pensive foreign policy over the last four years. Despite the more combative rhetoric employed by Mr. Romney, in substance the two men agreed on future policy: establish better security for our interests abroad, and project of an image of “American strength” to somehow thwart would-be attackers. The claim that such an image can actually do much to protect us in the face of extremists is a bit dubious, but both men agreed that they would try to employ it either way. Romney hit on his regular talking points, suggesting that Obama had “projected weakness” during a presidency that saw an exponential rise in drone strikes, the death of bin Laden, and US military intervention in Libya. On Libya, Pres. Obama was quick to point out that he “took leadership in organizing an international coalition…at a cost of less than what we spent in two weeks in Iraq” in order to depose Qaddafi. Gov. Romney criticized this reliance on surgical missions such as drone strikes at first, saying that “we can’t kill our way out of this mess"- a statement that I agree with, but later in the debate, he seemed to go back on this point, agreeing with the President’s increase of the use of drone strikes. On the topic of Syria, the candidates couldn’t find a difference to stand on. In fact, the most aggressive part of this portion came when the candidates tried to convince the world that they love Israel best. Gov. Romney stated he would identify “responsible parties” within the Syrian opposition and magically replace Bashar al-Asad with said parties, all without U.S. military involvement. Pres. Obama said essentially the same thing, and closed by saying “[Gov. Romney] doesn’t have different ideas and that’s because we’re doing exactly what we should be doing to try to promote a moderate Syria leadership.” Pointing out the obvious, neither candidate could find a way to distinguish their policies from that of their challenger. Romney and Obama then talked about America’s role in the world, which I have more than a few qualms with. He claimed: “the mantle of leadership for promoting the principles of peace has fallen to America. We didn’t ask for it, but it is an honor for us to have it.” But we did ask for it, actually. The entire 20th century of American interventionism is a case study in us “asking for it.” Pres. Obama also made a vague patriotic statement about our role in the world: “America remains the world’s one indispensible nation.” American exceptionalism clearly runs deep in both sides of the political spectrum. Biggest disappointment of the debate: when asked the question of what they would do if Israel bombed Iran, both candidates refused to answer. Romney insisted “let’s not go into hypotheticals like that,” except going into “hypotheticals like that” is the Commander in Chief’s job. The American people deserve to know that if a US ally attacked a sovereign state without coordinating with the U.S., would we go to war to defend Israel in flagrant violation of international law? Would we give Iran the gift of siding with the Israelis and breed an entire generation of Muslims – Arabs and Persians alike – that despises America? These questions will not be answered during the course of this election and yet may pose the most dangerous concrete military threat to the United States. Pres. Obama's sidestepping of the issue did nothing to clarify what the US will do if Israel takes such an extreme step. A difference in opinion finally came at the tail end of the debate. When asked what poses the biggest future threat to America, Obama said that it would “continue to be terrorist networks,” while Romney seemed to indicate China, although failed to make the allegation outright. According to Romney, “from day one, [he] will label [China] a currency manipulator.” The moderator quickly pointed out that this could, in fact, generate a trade war. Such an extreme action belies the complexity and inherent delicacy of the US-China relationship and would do much to unravel the mutually beneficial ties we have built over the last four decades. It would be naïve, foolish, and hurt the American people more than anyone else in the equation. The debate was a far cry from a Rumble in the Jungle. The most memorable lines from either candidate were “horses and bayonets” from Obama and “I agree with the President” from Romney. They both were aggressive, but only towards each other. I feel as though I can breathe a little easier knowing that the Republican Party seems to have finally turned away from the disastrous foreign policies of the Bush era. Their domestic conservatism may have increased and swung to the extreme on some issues, but even Romney avoided admitting he would launch a pre-emptive strike on (for instance) Iran. Both men made the requisite vague statements, dumbing down foreign affairs to a level that could be understood by the majority of the American electorate, although I bet more than a few people were Googling Mali. I can only hope that in practice, their policies match the nuanced, complicated reality that is world politics and not the generalizations that sell so much better to their constituents. Otherwise, all we really learned is that both men don’t like war but definitely like peace, and I guess that is a sentiment both conservatives and liberals can take pride in sharing. Are These Economic Sanctions Going to Backfire? The New York Times this morning published an article describing new sanctions the E.U. has put in place on Iran, specifically related to trade in metals, finance, and natural gas. The sanctions are such that it is nearly impossible these days for Europeans to do business in any way with Iranians, effectively severing financial ties between the two entities. Surely, this will be another staggering blow dealt to the already floundering Iranian economy. Perhaps the amount of trade the European Union does with Iran is miniscule in comparison with the United States and other leading global powers; however, I applaud the E.U. for their most recent round of trade sanctions on Iran given their current dismal economic situation. That does not mean I approve of them, though. The Western powers find themselves in a difficult situation when it comes to Iran these days, for several reasons. The never-ending train wreck that is Syria has added increased instability to what is normally a highly unstable region of the world – the United States and Europe must tread very carefully. Iran’s continued support of Assad has maybe drawn more ire from the Western world, but the overall relationship is so negative that this added irritation wouldn’t affect things much. When it comes to Iran itself, the nuclear debate continues to rage on, with neither side making much of an impact on the other. Personally, I do not believe Iran is as close to developing nuclear arms as many Republicans have asserted lately, but I do concede that it would be foolish to let Iran continue to do as they please. While Iran may be some ways away still from the 80% uranium enrichment they’ll need for nuclear weapons, my colleague Vicky has pointed out that as the process moves along, enrichment increases exponentially. The potential solutions to this conundrum seem scarce, if not non-existent. Military action is absolutely out of the question – if we have abstained from such intervention in war-torn Syria for 18 months, we cannot justify invading a country that comparatively is highly stable. Even clandestine operations are extremely risky. Should the C.I.A. or any similar organization be caught in Iran, the repercussions from China and Russia would be painfully draconian. The situation is not yet dire enough to warrant such a risk. Economic sanctions seem to be the last viable option. And so far, it seems that they have been extremely effective. Last month, Iran’s currency, the rial, lost 40% of its value against the dollar. Oil production is the lowest it has been since 1988, down dramatically from last year. And with the E.U.’s latest sanctions, things will only get worse for Iran. Here’s the thing: the Iranian leadership doesn’t care. Ayatollah Ali Khamenei continues to shrug off the sanctions to the media, and President Ahmadinejad seems only marginally more concerned. It is Iran’s middle class that is bearing the brunt of these sanctions, as jobs decrease, prices increase, and the currency continues to be undervalued. The sanctions are working because the U.S. and Europe wanted to put the Iranian government in the position of having to bail out their middle class from total economic chaos, but the problem is that so far the government seems to have spurned these people in lieu of their beloved nuclear program. Take about the all-time backfire. Maybe the threshold has simply not yet been reached, and Iran will eventually throw in the towel and back off the nuclear program in order to save their middle class. I hope that is the case. But if they don’t, the U.S. will have an even bigger, and more immediate problem to deal with than nuclear weapons – an Iranian middle class that despises us even more than they used to, and the perfect economic environment for radicalism to thrive in. We need to ask ourselves: at what cost will we foster yet another country for al Qaeda and its affiliates to burrow in and strengthen? This is not to say al Qaeda and its affiliates are not already in Iran. But without a serious re-evaluation of the sanctions we are imposing, we may see their presence explode in the future. My fear is that that explosion will be just as bad as a nuclear bomb’s. Of all the human rights issues dealt with by the United Nations, arbitrary detention receives the least attention and yet leads to a plethora of other violations. The Commission on Human Rights (the Human Rights Council or HRC since 2006) created the Working Group on Arbitrary Detention (WGAD) in 1991 to deal with the growing tide of reports of arbitrary detention occurring worldwide. The phenomenon of arbitrary detention is nothing new; people have been detained by governments without legal basis or recourse since time immemorial. Yet the creation of international human rights laws in the 20th century made arbitrary deprivation of freedom internationally illegal for the first time. Since the entry into force of the first binding agreements on detention, the illegality of arbitrary detention has crystallized into customary law, meaning that all states must respect it regardless of membership to any binding agreements. In practice, arbitrary detention not only continues to be a problem, it is becoming more widespread. The WGAD is mandated to “seek and receive information” on detention from various channels and follow-up on cases of detention found to be arbitrary with communications directly to governments. At the time of its inception, many observers were pleased and hopeful to see a UN Special Procedures body given such a dynamic mandate; until the WGAD no other Special Procedures had been given such an active power to not only receive complaints but also to investigate them. Yet since its establishment 20 years ago, the WGAD continues to have its mandate renewed and less than 50 percent of governments to whom it sends communications even bother to acknowledge their receipt. Due to problems of enforcement, types of detention, and organization the WGAD falls short of the high hopes that accompanied its creation. Nevertheless, it remains the only HRC body through which victims of arbitrary detention can at least seek recognition of their situation, if not true justice. Arbitrary detention has been illegal in international law since the Universal Declaration of Human Rights in 1948 specifically forbade it in article 9. The International Covenant on Civil and Political Rights, a legally binding document upon the parties (167 countries), also bans arbitrary arrest and detention in article 9(1). In the time since the creation of the first international agreements on the illegality of arbitrary detention, it has become accepted as customary international law. The WGAD was created to address the fact that despite the international laws and norms forbidding it, arbitrary detention persists worldwide regardless of the country concerned. Even developed countries such as the United States persist in their practice of arbitrary detention and illustrate the transcendent nature of the issue at hand: it occurs in every country, against every group, regardless of the state’s level of development, wealth, or education. The WGAD falls under the umbrella of the United Nations HRC’s Special Procedures. It is one of 38 mechanisms that analyze and report on human rights situations either occurring in a specific country or falling under a thematic category. Special Procedures operate in different ways and have very different mandates: they can be chaired by either a single Special Rapporteur or a Working Group of independent experts and themes range from indigenous rights to the effects of foreign debt. Yet they are all international whistle-blowers on human rights violations and are some of the most accessible means through with individuals and non-governmental organizations (NGOs) can make claims of violations of internationally protected rights. In the current global system, this is extremely important as entities like NGOs and individuals find themselves placed at the mercy of state actors, the most powerful legal personalities. 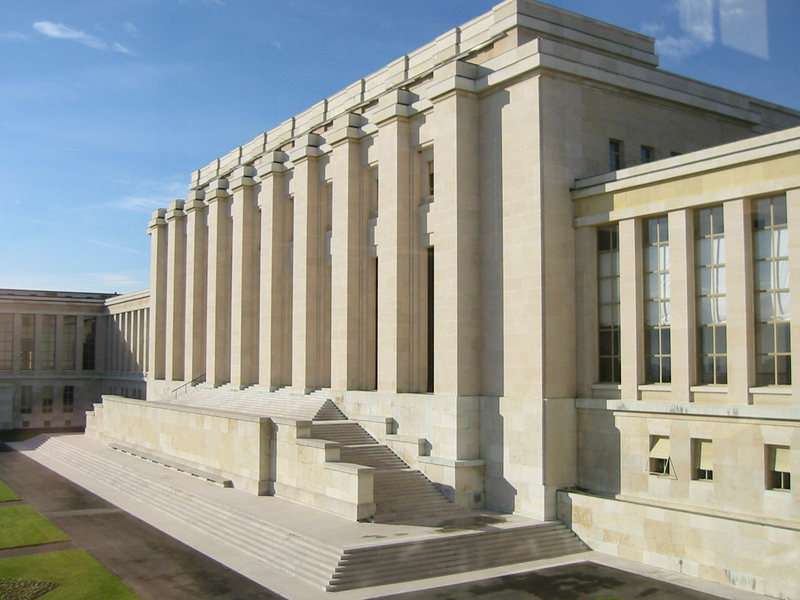 The WGAD is unique in that it is the “only non-treaty-based mechanism whose mandate expressly provides for consideration of individual complaints.” Since 1993, it can also take up investigations of its own accord without a specific complaint. Ordinarily, the only recourse for individuals whose international rights have been violated is much lengthier and must be carried out following many steps through the eight UN treaty bodies. They must have exhausted all domestic remedies, their states must be party to the treaty in question, and the state must accept the treaty body’s jurisdiction. Considering that states stand to lose much and gain little should a treaty body find them in violation of human rights, few states agree to jurisdiction and many are not party to any treaties with enforcement bodies at all. Seven of the human rights treaty bodies can consider individual complaints when making their reports on and recommendations to states, but states must usually be a party to an optional protocol of the treaty, as in the case of the Committee Against Torture, through which individual complaints may be considered only if the state has ratified the optional protocol. The WGAD operates differently than a treaty body because all states in the Human Rights Council are automatically subject to its opinions, urgent appeals, and country visits. It also makes an annual report to the Human Rights Council that is influential at the time of elections of member states or decisions to suspend members. As a Working Group, the WGAD functions through five elected members instead of a single Special Rapporteur. This organization was necessary for the creation of the WGAD to gain the support of non-Western states that originally saw the Group as a Western imposition. The five members are also aided by a Secretariat that organizes and writes up communications, opinions, urgent appeals, and reports for the group. The creation of the Working Group came after a report made by the Sub-Commission on Prevention of Discrimination and Protection of Minorities that suggested arbitrary detention was not only a global problem worthy of a Special Procedure but also a problem that had shown a dangerous trend towards expansion throughout the 21st century. Hoping to avoid political scuffles over the terms describing detention outside of internationally accepted legal norms, the mandate writers settled on “arbitrary detention” which they clarified as encompassing all words relating to imprisonment including detention that is technically legal within domestic confines but that falls outside of international norms. This points to the disturbing trend among states to detain individuals without legal process, incommunicado, secretly, or under administrative detention, all issues listed by the Group in their 2010 report. It also indicates the growing problem of states holding refugees, migrants, and asylum-seekers in detention centers legal under domestic law for non-nationals without access to courts or timely release. The WGAD falls far short of expectations in almost all of these areas, yet it is a vital tool moving forward for countries to be held accountable to their international obligations. Next I will discuss the challenges faced by the WGAD, a working model for increased efficacy, and why, in the end, it is essential that the UN Special Procedures bodies continue to expand and grow to protect human rights for all people. In July 2012, after long negotiations, the governments in Khartoum and Juba signed into agreement what was hoped to be a significant step toward peace between the newly separated states. Forged out of economic necessity, the agreement called for the resumption of oil production in South Sudan, which halted earlier in the year in response to Sudan and South Sudan narrowly avoiding war. The enmity stems from the fact that South Sudan's independence ceded not just land but 75% of the known oil reserves as well. Left strapped for cash and resources, Khartoum has grown desperately reliant on duties taken from South Sudanese oil travelling through Sudanese pipelines to the Mediterranean. Today, oil production is still at a standstill with promises from Juba that oil shipments will resume by the end of the year. Undoubtedly, the oil crisis has had vast implications for both countries that generate most of their national income from oil revenues, including cross-border violence, soaring food prices, economic vulnerability and diplomatic tension. Such is the immediate and medium-term future for both countries, whose symbiotic economies--hampered by lack of oil revenues and border and territory disputes--will define the peace process that moves forward. With economic strains stemming from violence along the border, and as border violence continues to justify political stagnation, Sudan and South Sudan's crisis is looking more and more cyclical and threatens to plunge both nations further into chaos and discord. The issue of oil is central to the conflict between Sudan and South Sudan. It was the cause of the Second Sudanese War (1983-2005), when Nimeiry declared Sudan an Islamic State and invaded the south for oil fields, therefore terminating the Southern Sudan Autonomous Region. This was ultimately a violation of the 1972 Addis Ababa Agreement, which ended the First Sudanese Civi War. Oil, then, was the driving force for the dissolution of internal agreements, civil war, and is currently doing more of the same. Just this summer, oil production in South Sudan was shut off because of mutual accusations of agitating political developments through proxy forces in the other's country. Almost all of the violence, instability and refugees sit atop known oil fields in historically disputed areas. 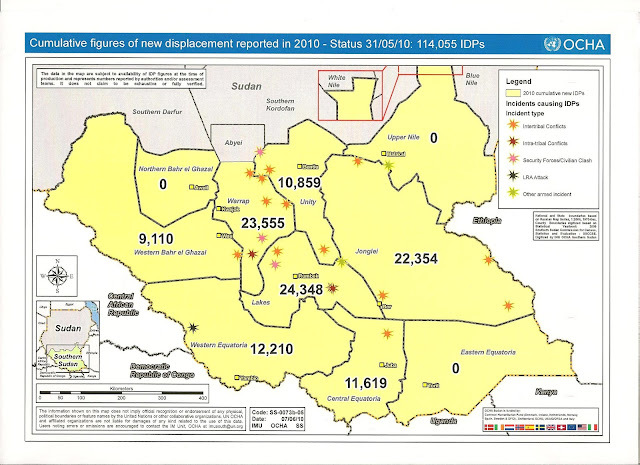 Quoting the UN, these are considered "outstanding issues" between Sudan and South Sudan. South Sudan faces other challenges in addition to its control over 75% of Sudanese oil. Stationed in the Juba Mountains and across South Kordofan, Sudan, is the Sudan People's Liberation Army-North (SPLA-N), displaced from their host organization in the south by an international border. Violence flared in these areas this summer, and the SPLA-N's presence continues to be a point of tension between the two countries. 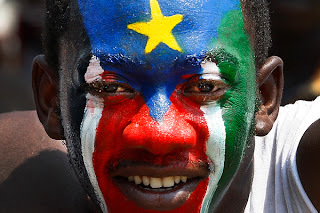 Juba has been resistant to criticize the SPLA-N, adding to the friction. The militia group also intends on engaging with the political process in Khartoum, although still technically part of the broader Sudan People's Liberation Movement (SPLM) in South Sudan. This duplicity adds to the unpredictability in the region, especially since the SPLA-N has been implicated in numerous skirmishes within Sudan. Another focal point of violence and instability is the disputed Abyei region. Jointly administered as part of the 2005 Comprehensive Peace Agreement, Abyei holds rich oil fields, despite its size. At the UN, the Security Council established the United Nations Interim Security Force for Abyei (UNISFA) to deter the fighting and act as a buffer so as to facilitate negotiations on Abyei's final status. For now, it's a demilitarized zone occupied with peacekeepers and once again put on the back burner for future negotiations. In addition to the UN providing a peacekeeping mission for the small region, the African Union has been asked to intervene as well in the hopes of facilitating a peaceful settlement. UNMISS, or the United Nations Mission in South Sudan, has encountered difficulties in maneuvering toward peace as well. Initiated as a complementary mission to the government in South Sudan, UNMISS appears a less and less effective means toward nation-building, given the outstanding issues of inter-communal violence, inadequate disarmament-demobilization-reintegration (DDR) policies and the lack of political will to reach a comprehensive agreement. One of these challenges is UNMISS' DDR programs. For the estimated 150,000 non-SPLA-affiliated combatants in South Sudan, UNMISS along with partner organizations have only established three, 50-person DDR sites. UNMISS is also supremely limited in what it can achieve on the ground with regards to military personnel and equipment, especially regarding the lack of badly-needed helicopters. Without the necessary military equipment to facilitate monitoring violence along the border and within South Sudan, UNMISS remains extremely limited in its ability to engage and prevent the problems it's intended to fix. The future of Sudan and South Sudan looks uncertain, and indeed unstable, but ultimately their fates are intertwined both economically and politically, which inherently renders the peace process complex. Only until a final decision is reached on the oil-rich disputed regions will there be a chance for enduring peace between the newly-separated countries. In what is the most heightened and well-publicized labor tension of recent months, South Africa’s mining sector is undergoing some of the worst strikes in recent memory. Somewhat reminiscent of the West Virginia Coal Wars which occurred between 1921 and 1922, South Africa is undergoing a rapid and violent transition to organized labor, almost certainly a byproduct of the immense success the mining industry has had recently. While it is unclear when the turmoil will be resolved, South Africa remains a very clear and very present example of the change in developing nations that will likely persist for decades to come – workers around the globe are refusing to continue accepting the meager wages and abysmal lives they work so hard for. As multi-national corporations continue to enjoy record profits, workers will become more and more cognizant of the disparity between themselves and their employers, and more often than not, the result will be widespread violence. The problems in South Africa stretch back to August, when police made worldwide news by firing upon striking workers at a mine, killing 34 of them. The result was outrage not only nationally, but throughout much of the world, further exacerbated days later with news that the police would not have charges pressed against them. Since then, workers have continued to strike, although it has been unsuccessful in achieving much as of yet. The New York Times estimates that approximately 75,000 miners in South Africa are currently on strike, which is just about one quarter of the total mining population. Although still not willing to budge on the bargaining table, Anglo American Platinum, the enormous platinum mine in the spotlight because of the strikes, has admitted that it is losing profits rapidly. In an attempt to quell this, they laid off 12,000 striking miners last Friday as a warning to the remaining miners on strike. The stakes are high, and desperation is beginning to show. Moody’s recently downgraded South African bonds, signaling that the strikes are hurting not just the mining companies, but the South African economy as a whole. Realistic compromises need to be discussed and resolutions made before the situation continues to spiral out of control. In a country still smarting from the Apartheid era only a few decades ago, the strikes highlight racial tensions, not just labor ones. Having the company “Anglo American Platinum” laying off and repressing predominantly black workers signifies that race issues are still highly prevalent in the country; this will undoubtedly prolong the strikes and delay complicate negotiations to be had. Surprisingly, the South African government has yet to apply pressure to Anglo American Platinum, although I am sure that will not last much longer. The mining industry needs to restructure itself and re-evaluate its employer-employee relationships in order to better accommodate at least some of the strikers demands, or else the South African economy will surely crash and burn and the country will be thrust back into a position of instability that many of their neighbors currently suffer from. Tensions between employers and workers will never go away. They serve as an indicator that capitalism is functioning, albeit perhaps not the way it should be, and striking a balance between the needs of workers and the wants of owners will remain about as feasibly struck as a college senior’s balance between work and play (excluding, of course, my co-author Zach). However, there are stages of labor tensions, and right now much of the world is struggling to battle through the tensions that America, the U.K., and the rest of the developed world struggled with over a century ago. In a highly globalized world, the developed world must empathize, and support these developing countries. While union disputes continue to plague the United States, the average quality of workers in this country is very good, something that was certainly not achieved overnight. Recognizing this and exerting our economic might by imposing certain trade regulations, and reducing or increasing aid is paramount in helping improve worker’s rights across the globe and decreasing production instability and potentially enormous trade quagmires. Many may disagree with me on this but ultimately organized labor is a good thing, for employers, employees, consumers, and everyone else involved in the production and consumption of goods and materials. What we need to focus on right now is helping our friends in the developing world see that as well. issuing new calls to Syrian president Bashar al-Assad to step down from his position. What may be less apparent (although also understandable), given the incessant media coverage of the election this week, is that the United States is violently defecating in their figurative pantaloons. And if they aren't, they certainly should be: the Syrian uprising was a disaster several months ago, when the death toll of innocent civilians reached 20,000; now, the crisis is pouring over borders and sparking instability in countries such as Turkey, which is widely seen as the bastion of secular Islamic democracy and a role model for the Middle East as a whole. With the conflict in Syria creeping this close to the Turkish border, Turkey has been spending valuable time and resources on protecting themselves from what seems at this point to be an imminent, more serious attack. The resources spent on this have been taken from other facets of society, and the Turkish government is not the only one to notice: the PKK, or Kurdistan Workers' Party, an opposition party responsible for frequent violent attacks on the Turkish government, have begun taking advantage of the reduced military presence within the country itself. Violence is widespread and if Turkey cannot quell the rising PKK militia, the results for the country could be catastrophic. The fragile state of the Middle East at the present moment is that of a row of dominos. This is no new concept, but one often worth reiterating, especially at a time like this. Instigating with Turkey will likely not end with Turkey - Syria, if it continues on the path it is headed, will soon be the catalyst for a regional conflict involving many of the states so volatile to begin with that the United States simply cannot do enough to keep them stable and peaceful. We are not just looking at a tragic revolution anymore, we are looking at what has the potential to be a frighteningly colossal multi-state conflict. President Obama certainly has a lot on his plate at the moment, given that the presidential election is a mere month away. However, he should be pressing the U.N. for a multilateral military intervention in the region before it is too late. I have been saying for months that such an intervention was needed in Syria, primarily because of the amount of casualties the country is suffering. From a humanitarian standpoint, my argument was admirable, but perhaps not enough to rouse support from those more realist than myself. This is no longer a plea on behalf of the innocent civilians dying daily in Syria. The situation is dire, the potential consequences profound, and the necessity of a resolution is immediate. Without one, we may be facing one of the worst wars of our generation, and likely since World War II ended almost eight decades ago. The importance of sectarian identity in the Persian Gulf has risen to global importance, especially in the worldwide media in the last decade. Yet stories of “sectarian clashes” and “sectarian tensions” that make the headlines do little to explain the relationship between overlapping tribal, regional, and national identities and one’s religious sect. Upon closer examination, identity becomes a shifting, ever-changing concept and thus broadly labeling the people of the Gulf as being only either Sunni or Shi’i is not only a broad generalization, but also can lead to misconceptions about the advancing and receding nature of sectarian identity’s importance. By examining the cases of the Sunni and Shi’i populations of Bahrain, Saudi Arabia, and Iraq, it is easier to demonstrate the nuances of sectarian identity, particularly in relation to questions of regime security, tribalism, regionalism, and nationalism. A sign at a protest in Bahrain reads "Not Sunni, Not Shi'ite, United for the Homeland"
The clarification of what exactly constitutes identity and how human beings construct this very personal concept is essential to understanding Sunni-Shi’i relations. As defined by Dale Eickelman in “Culture and Identity in the Middle East,” identity is an ever-changing concept of self that consists of overlapping layers: family, tribe, religion, social strata; all of these and much more make up identity. Religious identity is built upon a shared “myth-symbol complex” according to Fanar Haddad in his book Sectarianism in Iraq. That complex emphasizes shared beliefs, shames, and glories that bind people of a certain sect together. This identity can be assertive (the extreme side of which is aggressive), passive (extreme: apologetic), or banal according to Haddad, and is constantly moving along that scale given socioeconomic and political circumstances in an area. It is also not mutually exclusive of the other identities present in a person, and especially when it comes to national identity there are often competing sectarian groups who also view themselves as either a part of or the leaders of a national identity. The complex nature of identity, specifically sectarian identity, belies the use of generalizations across an entire region but for one: when dealing with how sectarian identities affect politics, a major concern in the Persian Gulf states will always be the influence of Shi’a Iran on their own Shi’ite populations. Since the Islamic Revolution of 1979 and the collapse of the Saudi-Iranian “dual pillar” system of regional security, there has been significant concern on the part of the Arab Gulf over the exportation of either an Islamist or Shi’ite revolution in their own countries. This has been central in regional security strategies and led to the creation of the Gulf Cooperation Council in 1981 as a political and economic bulwark against the Islamic Republic of Iran. What the Gulf leaders are afraid of: protests in Iran in 1979. Within individual countries in the Gulf, however, the interplay of sectarian identity with politics, society and the economy is much more diverse and specific to the situation in the state under examination. The Kingdom of Bahrain, led by the Sunni al-Khalifa family, is made up of about 65-70 percent Shi’ites who view themselves as discriminated against and marginalized in a state that is rightfully their own. Both in the early 1990s and 2011 to the present day, significant portions of the Bahraini population rose up against the monarchy, something that did not occur in Sunni majority-led monarchies to the same extent. In Bahrain, the minority-led government shapes the sectarian debate, as does its brutal suppression of protests and violations of human rights. Because of its strategic location on the Kingdom of Saudi Arabia’s eastern border where much of the Saudi Shi’ite population lives, GCC troops led by Saudi Arabia arrived in 2011 to violently put down Shi’a unrest so that protests in Bahrain did not spread outside of the country and Iran (a traditional claimant on Bahrain) was not given an opportunity to retake the archipelago. 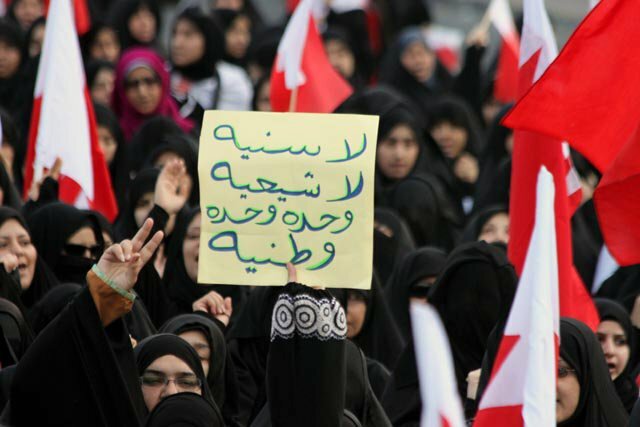 Due to its government and strategic value to wealthy Saudi Arabia, Bahrain’s sectarian identities form the basis of political unrest as well as external intervention in a way unheard of in other Gulf states. The Kingdom of Saudi Arabia itself presents a very different demographic situation as well as an example of tribal and regional identities overlapping with sectarian ones. The Kingdom is composed of 10-20 percent Shi’ites, mostly located in the oil-sodden Eastern Province. The economic importance of the Eastern Province ensures that King Abdullah and his successor will not easily part with total control over the region and its inhabitants. 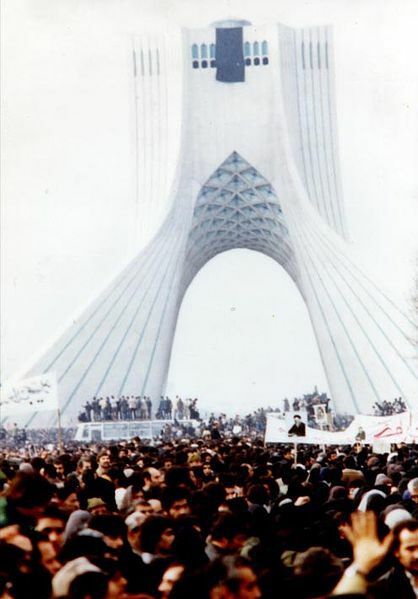 In 1979-1980, when the Shi’ite population began protesting rule by Riyadh, the government swiftly put down the unrest given the timing and the perceived threat to regime security. 1979 was a dangerous year in Saudi Arabia: the Islamic Revolution was toppling the Shah in Iran, the Great Mosque in Mecca was taken over by extremists, and the Soviet Union had just invaded Afghanistan, leading to calls by Muslims the world over for Saudi intervention. Since that time, Saudi Shi’ites have switched tactics from armed conflict to seeking to establish cultural authenticity (al-asala al-Shi`yya) within Saudi society in the 1990s. Concurrently, the Saudi government has begun a process of coopting the Shi’a (especially the elite) to discourage horizontal collaboration among opposition groups. The rise of the Sunni-led Sahwa opposition movement in the 1980s and 1990s meant that Shi’ites were no longer the only internal threat in the Kingdom, and they were certainly not the most dangerous. Tribalism and regionalism have played major roles in the search for cultural authenticity within the Shi’ite population of Saudi Arabia. Tribal identity is of paramount importance in establishing “ownership” of the Saudi national identity, as is pointing to the marginalization of Sunni Hejazis by those from the Najd region as a basis for cross-group cooperation. Although the Saudi Shi’a community rose up in the Arab Awakening, it was to a lesser degree than their neighbors in Bahrain and the Shi’a elites were quick to side with King Abdullah and the government, calling for an end to the protests. Iraq provides yet another unique example of sectarian identities within a Gulf state that has many important cultural groups all under the banner of the “Iraqi people.” Perhaps the poster child for global formulations of a Sunni-Shi’i divide, Iraq in reality is a mixture of regional, tribal, and religious identities. The 1991 uprisings in both the Kurdish (but Sunni) north and mostly (but not all) Shi’a south saw the country divided regionally rather than by sect during the economic crisis of the 1990s (the Sanctions Era). Tribalism also played a key role in the disproportionate economic privation of the south, as Saddam Hussein’s family was of the centrally located Tikritis who were thus favored due to tribal affiliations with the ruling family. Shrinking resources meant the state relied on tribal leaders to provide services it had in the past, and tribal lines often cut across sects and, to a lesser degree, regions. Iraq also includes multiple other religious sects than just Sunnis and Shi'ites: Mandaeans, Christians, Assyrians, Yazidis, and Turkmen also make up large swathes of the population. Sectarian identity did, however, play a role in the violence in Iraq in recent years. Following the US invasion in 2003, Iraqi Shi’ites saw themselves as able to assert their sectarian identity for the first time in more than a decade. As they make up 55-60 percent of the population, such assertions of identity, even if not on the extreme-aggressive end of the spectrum, led to increasing tensions with the Sunni population that exploded in violence. “Sectarian clashes” escalated through 2007, when the US-led surge helped to significantly decrease casualties. Still, domestic political concerns abound over Prime Minister Nouri al-Maliki’s increasingly Saddam-esque control of security forces and the intelligence branches of government, and national cohesion in the face of multiple tribal, regional, and sectarian differences remains elusive. With so many competing identities at play, the convenience of labeling Iraqis as simply Sunni or Shi’i is a gross over-generalization. While understanding the overarching differences between the Sunnis and Shi’ites of the Gulf is certainly important to forming a deeper understanding of regional politics and security, in reality painting people in the broad strokes of sect alone leaves no room for the consideration of the multiple identities at play within all human beings. Tribal, regional, national, economic, and social identities play just as an important role in people’s conceptions of self at any given time, and years of economic hardship or social and political marginalization often lead to people turning to any of these identities for support and mobilization mechanisms. The importance of the domestic political situation also cannot be emphasized enough in explaining the unique situation of Sunni-Shi’i relations in individual Gulf states, as demonstrated by the cases of Bahrain, Saudi Arabia, and Iraq. In the end, identity of any kind proves to be a complex concept and thus to generalize what it means to be Sunni or Shi’i in the Gulf renders sectarian identity static, simplified, and altogether much less interesting than the reality on the ground.